If you've been following my blog for a while, you will likely know how much I admire Sylvia Duckworth and all of the great work she does with her students. She is also an amazing advocate for educational technology and has inspired many educators along their path of self-directed professional development, myself included. The recipient of the Prime Minister's Award for Teaching Excellence, Sylvia has also been featured in Professionally Speaking, the magazine of the Ontario College of Teachers and has presented workshops and keynotes at several conferences. We first connected on Twitter and it was because of our virtual professional learning network that I found out about her workshop featuring GAFE Tools for FSL, which further inspired me to pursue my Google Educator certification, and later Google Certified Educator: Level 2 certification. So eager to learn how she created her sketchnotes, I approached her after the workshop to ask which app she uses. She was so kind to take some time to share some insight on sketchnoting and since then, I've been hooked. While I've only dabbled in the art, I now have a greater appreciation for the amount of time and effort that goes into one of Sylvia's sketches. I first tried creating a simple sketchnote that featured internet safety guidelines and it took me for-e-ver! 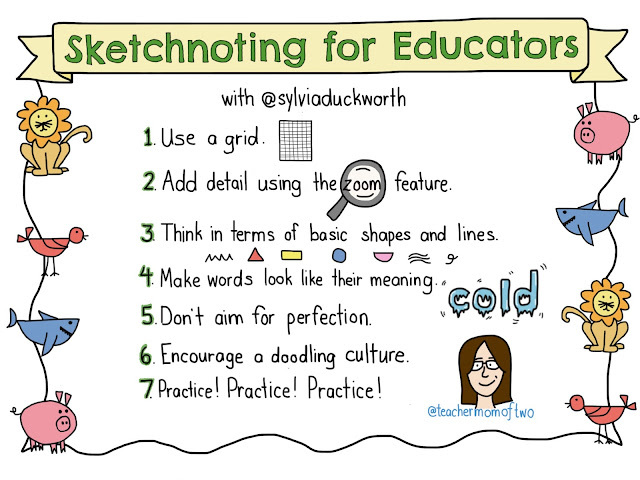 But, if there's one thing I will remember from her recent live webinar on sketchnoting, it's that anyone can draw and that it gets easier with practice. To prove that anyone can draw, watch the following video of Graham Shaw's TEDx talk. Sylvia shared an excerpt from this video during her keynote at the last Toronto GAFE Summit and it was so fun to see everyone's drawings. In the sketchnote above, I highlight some additional tips for sketchnoting, such as using a grid on the bottom-most layer which helps with proportion and writing on a straight line, and using the zoom feature to fine tune and add details. I have also included the video of her webinar below which I encourage you to watch, even if you think you're not good at drawing. In fact, that's the exact reason why you should watch it. You don't even need a sketching app. You can try doodling on paper. There are a lot of sketching apps available now but I chose to stick with the Tayasui Sketches app for iOS. I purchased the pro version because I wanted access to all the cool features, which includes adding multiple layers. Drawing on multiple layers is one tip I would add to the list because it makes it easier to erase or edit certain parts of a drawing if it is on a clutter-free layer. I haven't really tried any other styluses other than the Adonit Jot Pro Stylus. It took some getting used to but I really like it now. The only problem I have had is leaving it on the sofa uncapped and then, when someone sits on it, the clear plastic disc at the tip pops off. It won't work without it but luckily I've always managed to find it. 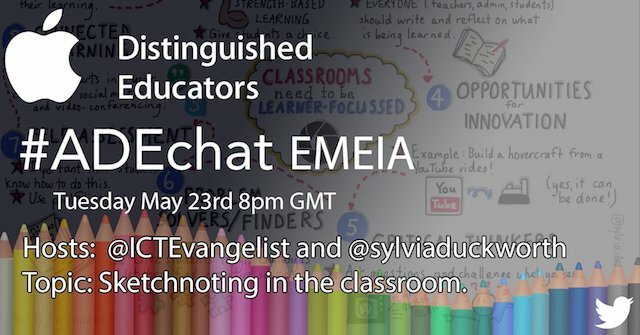 If you would like to learn more about sketchnoting, hop onto Twitter on Tuesday, May 23 at 8pm GMT for the next Apple Distinguished Educator #ADEchat: Sketchnoting in the Classroom. 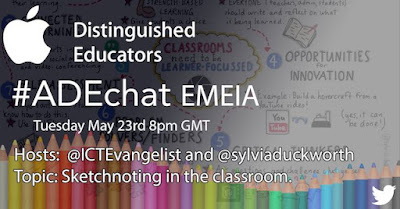 And if you want to be among the first to learn about an exciting new project that Sylvia is working on with Head of EdTechTeam Press Holly Clark, sign up here: bit.ly/Sketchnotes17. It's a lot of fun after you get the hang of it.